Italy came into the final fixture of the tournament with an outside, theoretical, chance to finish runners-up in the Six Nations, which was pretty remarkable for a team that had only ever finished third once previously – though the fact that they had only score eight tries in the previous four games suggested it was unlikely. But Italy had had a superb Six Nations. There had been a heavy defeat to England (but everyone lost heavily to England), and a scrappy 3-3 draw with Wales, but they had recorded good wins over Ireland and Scotland and deserved their third place at the start of the game. France had given their supporters the full range of emotions, superb at home, rather less so away. The suspension of Romane Menager after round four always looked a concern, but in practice the French coaching team rested several players for the fixture against a team they had beaten 57-0 twelve months before. But Italy had won two of the last three games in Italy, and for all Italians this is the game of the season. This one matters, and in front of a vocal crowd of roughly 3,500 they played like it did. Italy’s determination was shown from the very first minute. Recovering their own kickoff they very nearly scored straightaway, frustrated by a marginal knock-forward right on the French line. The next 20 minutes were even, with Italy just shading possession and territory, but France looking threatening. Even so, there were markers of something extraordinary as the regulation French maul, that gives them so many points, went backwards at their first attempt. Italy had prepared well. The set-pieces were also under control for Italy. Lineouts were solid – and lineout steals were going their way as well – while the scrum (normally another big French weapon) was effectively neutral. On 20 minutes it all came together for Italy, backs and forwards coming together for a move that ended with Sofia Stefan dotting down in the corner. Sillari’s conversion came back off the crossbar, but Italy were 5-0 ahead. 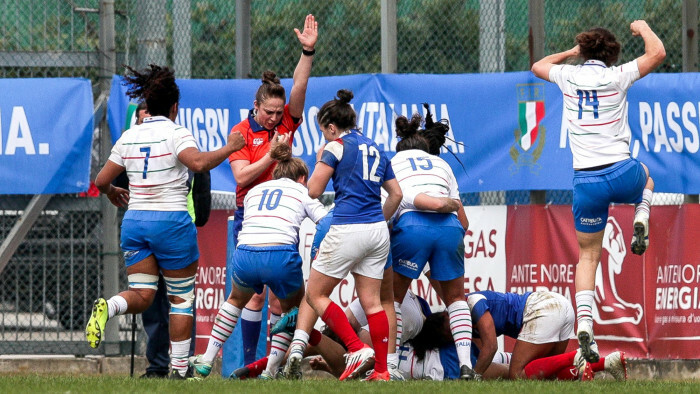 With five minutes remaining in the half a rare Italian lost lineout began a move that ended with Caroline Boujard scoring in the corner to tie the game at 5-5. But Italy were soon back ahead, thanks to a needless penalty for offside given away by France right in front of their posts. Half-time, Italy 8, France 5. If Italy had played well in the opening 40, they now raised their game still more. Straight on the attack, Aura Muzzo knocked-on with the line at her mercy two minutes, but a minute later they won a penalty which Sillari kicked with ease. 11-5 to Italy. With France soon afterwards down to 14 players thanks to a yellow card, Italy turned the knife a little more with Melissa Bettoni crashing through the French defensive line. With Sillari’s conversion Italy lead 18-5. With 25 minutes to go this was already Italy’s best ever performance against France in the Six Nations. A penalty a few minutes later meant the yellow had cost France 10 points, but back to full strength they pulled a try back from Ian Jason. After 66 minutes it was 21-12 to Italy – but France were back in the game. Tension mounted. France tried to build recovery, but needless mistakes and hurried passes kept giving Italy the ball. With two minutes to go Veronica Madia ripped the ball from French hands, passed out to replacement Sara Touesi who burst through the disordered French defence before finding Manuela Furlan who accelerated away to score in the corner. Bonus point. 31-12. The last two minutes saw everyone left on the Italian bench come on, and pent up joy that exploded on 80 minutes. Italy had beaten France by 31-12 – and were runners-up in the Six Nations.